Mounted Assistance Unit (MAU) - Equestrian Trails Inc. The Mounted Assistance Unit (MAU) is a volunteer organization under the supervision of the County of Los Angeles Department of Parks and Recreation as a “Volunteer Program.” The purpose of the MAU is to patrol the trails on horseback and to promote the safety of all users by reporting any hazards or dangerous conditions found in the park or on the trail system. The MAU also assists park visitors in their efforts to enjoy their leisure time during their visits. 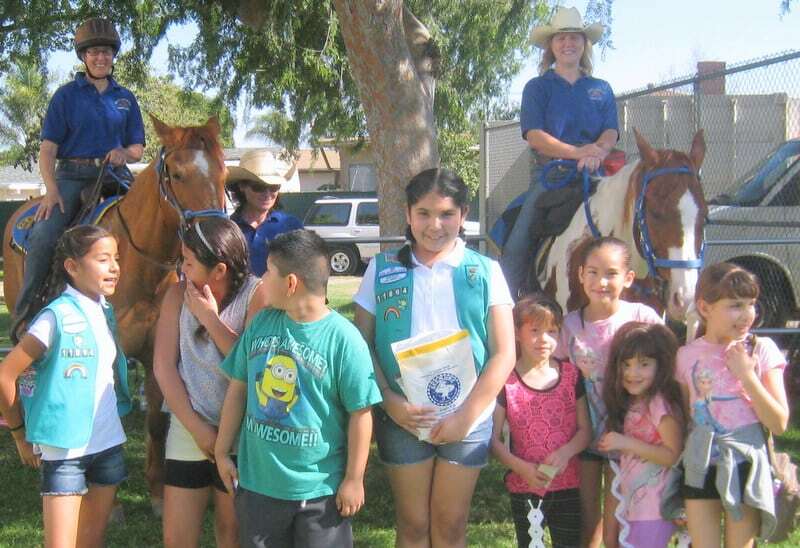 MAU members should also participate in activities such as campouts, picnics, parades, and group trail rides. The mission of LACO (County of Los Angeles Department of Parks and Recreation, referred to as LACO) is to provide the residents and visitors of Los Angeles County with quality recreational opportunities that promote a healthy lifestyle and strengthen the community through diverse physical, educational, and cultural programming, and enhance the community environment by acquiring, developing, and maintaining County Parks, gardens, golf courses, trails, and open space areas. The LACO and MAU recognize the value of meaningful and mutually-beneficial partnerships between the LACO and MAU. The LACO and MAU are committed to developing and maintaining this partnership and are committed to supporting the goals and objectives of the LACO and MAU programs at the designated park sites outlined in this agreement. 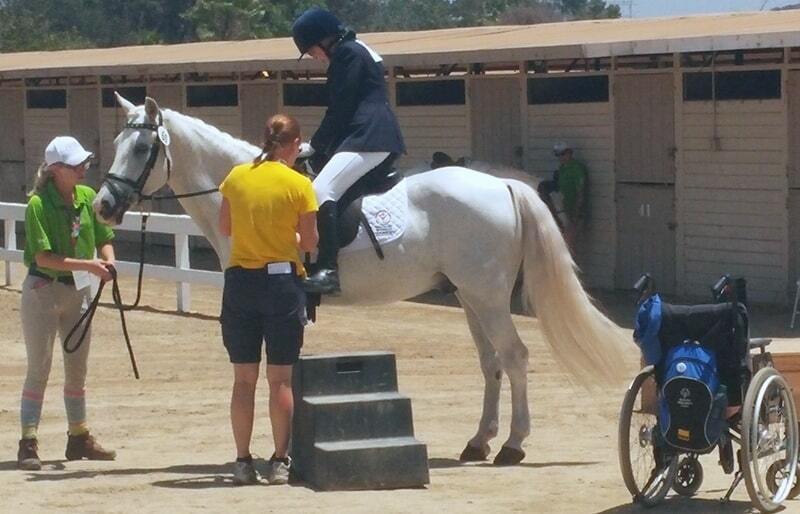 There are four MAU’s which patrol the LA County Parks on horseback. If you are interested in joining, the contact e-mails are listed below. 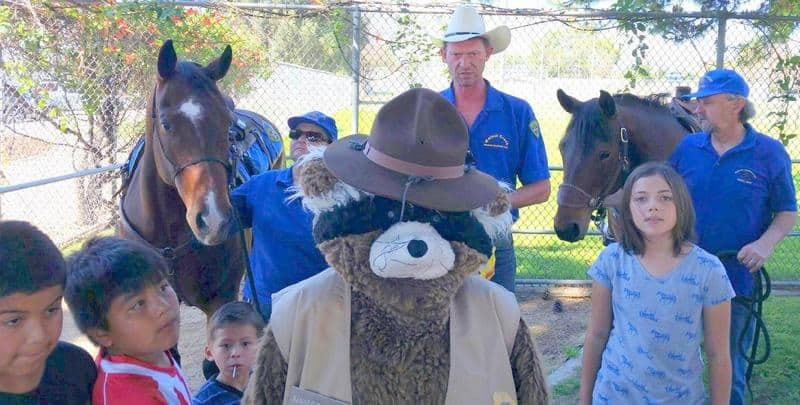 The Mounted Assistance Units were requested to be present at four kick-off rallies for the LACO-sponsored youth leadership program, WILD (Wildlife Inspired Leadership Development) 4 Nature. Walnut Creek MAU (Cindi & Charlie H.) attended the first event in Pasadena, and Bonelli MAU (Winnie G., Mo Davis, & Kathy B.) attended the second event in Whittier. The third event was attended by both Walnut Creek and Bonelli members (Mark B, Jack J., & Jean C.). North County attended the last rally in Sylmar at El Cariso Regional Park which was attended by Gilbert Chavez (ground support). Emma Chavez assisted with the coloring table and two newly certified riders (Terri Smith with Annie, and Cynthia Chaidez with Durango). All the events were successful, with over 200 park visitors enjoying the well-mannered MAU horses and other exhibits. MAU members continue to be of service to the community in this way. The MAUs provided coloring for the children, horse facts, a demonstration of horse maneuvers, along with answering many questions asked by the children and parents. Also, MAU members heard many loving stories from the adults of their childhood horses and ponies. 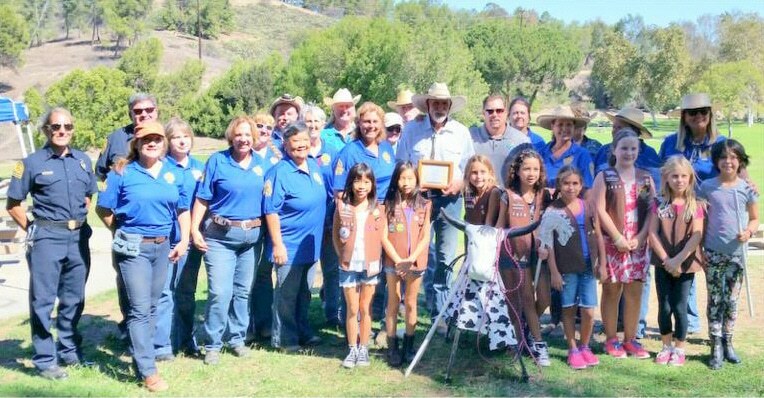 Walnut Creek MAU held their “All About Horses” event at Bonelli Park October 2015. It was fun for the whole family and focused on horse education, trails and trail etiquette. 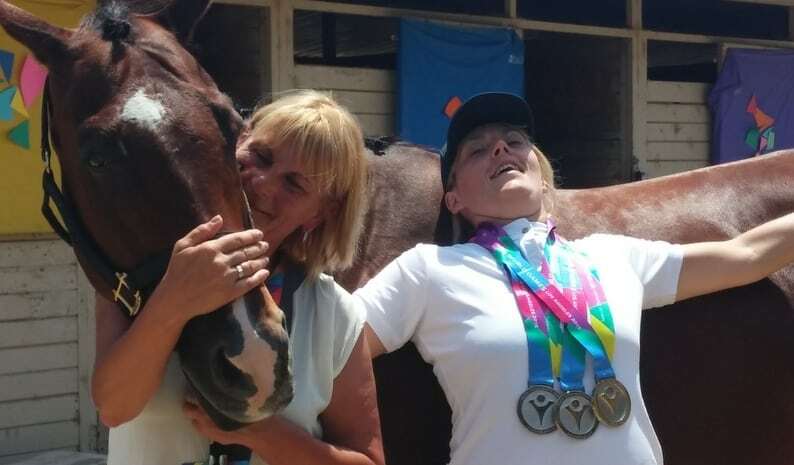 The picture says it all: From Wheelchair to Horse’s Back, The Special Olympics were held at the Los Angeles Equestrian Center and it was a great success. The MAUs had several of their members with their MAU horses at the event. Thank you all for donating your horses in this very special, once-in-a-lifetime opportunity. I suspect these volunteers have received more than they gave. All thee MAUs participated in the San Dimas Western Days Parade. Whittier Narrows MAU has been invited to assist in patrolling at the City of Industry Hills Charity Pro Rodeo, celebrating the Pro Rodeo’s 30th year. Founded in 1985, this event has donated over $2.2 million to special children in need in the greater San Gabriel Valley area. MAUs enjoyed a multi-unit training that was held at the Bonelli Park, San Dimas. The four-hour training was divided into two sections: The first, an Obstacle Course which gave the riders a challenge to negotiate (thank you to Walnut Creek MAU for setting up the obstacle course); The second section had three life-saving simulations (horses working with choppy waters at the lake, actions to take with a near-drowning, and hands on applications of splinting). The simulations were instructed by the Bonelli Lifeguards (thank you all for assisting in the simulations). These type of events take a lot of hands-on to prepare, so thank you to Debbie P. and Sandra D. for organizing the training. Also, a big thanks to all those MAU members who participated in the training and those assisting on the ground with the training.